Are you new to the art of gardening? Don’t know what to do after planting some new grass seeds for your garden? Then read on and fret no more! I am here to help you, my fellow aspiring gardener, know when to mow new grass so you can keep your lawn in beautiful shape. We often make the rookie mistake of mowing grass as soon as we see that it has become too long or unsightly, but it’s actually more than that. These helpful tips will let you know if you should already do so. The first thing you need to consider is the time that has passed since your seedlings have germinated. Germination is basically when the seed sprouts after it has absorbed enough moisture to do so. This is affected by a number of factors such as the temperature of the soil and the variety of grass. In addition, if you mow too soon, the weight of the mower may compact the soil which makes it hard for the roots to spread and gain strength. Another thing to look out for is the height of the grass. Depending on the variety of grass, around 3-4 inches high would be the right height to cut grass for the first time. However, only cut one-third of the grass’s height at a time. This makes it so that the tips of the grass are narrow and fine, and that the blades of the grass aren’t too close to the crown which could potentially uproot your new grass. Before the grass is ready to cut, you have to keep the grass moist as it is a vital part of its establishment. Once it has reached the appropriate height for cutting, allow it to dry for 48 hours before it is cut for the first time. 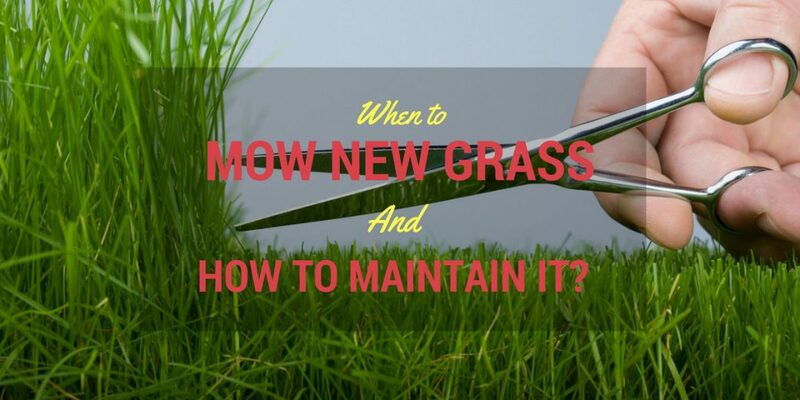 Dry grass makes it easy for the mower to cut them as the blades will glide smoothly through the grass, as well as prevent them from sticking to the blades that may cause them to get uprooted as opposed to wet grass. However, there may come a time when it’s absolutely necessary to cut the grass even when wet, like during the rainy season. In this case, you can go ahead and mow your lawn, but you have to be extra careful as explained here. Here is a video that further explains how to determine the right height to cut your newly seeded grass. It shows a neat trick to estimate the height of the grass by using your hand as a ruler to check if the grass is good to cut. When the time for the deed has finally come, you have to first make sure that your mower’s blades are sharp so that the grass is not torn off the turf. Keep the grass at a height of 2-3 inches, as cutting lower than this would make it easy for weeds and pests to plague your newly seeded lawn, and make it susceptible to heat stress as well. As for using the mower, you have to mow in different directions to keep the grass upright and prevent them from lying flat against the soil and get compacted to it as the wheels of the mower roll over them. Also, turn the mower slowly as you pass it over your lawn, as the mower’s wheel may pinch and peel the turf off the soil when you do quick or sharp turns. After all the work you’ve done to make sure your newly seeded lawn is correctly mowed for the first time, there may still come a time when it will have bare patches soon after it gets established. At this point, you can consider re-seeding them to keep your lawn looking good. Apply the tips mentioned above to determine the right time to first mow these patches while carefully avoiding them as you mow the rest of the lawn normally. Keep this up and soon, the bare patches will catch up to your established lawn and people won’t even be able to tell that there were bare spots at all! Cut only one-third of the grass’s height at a time. Follow these steps and you will definitely amaze your neighbors with your green thumb. Of course, not all lawns will grow in the same way, so please feel free to comment and ask questions if you come across a situation where the above tips may be hard to apply.